If you order by 2:00 pm in the recipient's time zone, we can typically deliver the flowers the same day Monday through Friday. For same day service on the weekend please order by 10:00am on Saturday, and we do not deliver on Sunday. Priority and timed deliveries are available for an extra charge. You many request a time frame in the special instruction box when ordering, and we will do our best to accommodate your request. Orders for Valentine's Day deliveries will be delivered between 8 and 6. Special priority delivery can be purchased at an extra cost and needs to be arranged in person or over the phone for any special requests. All web orders will go standard delivery with a guarantee of a before 6:00 PM delivery unless a priority delivery is selected and purchased. Normal delivery times are 9am-5pm daily for orders going to a business, 8am-7pm for orders to a residence, hotel, or hospital, and 9am-2pm for orders going to a school. During major holidays such as Valentine's Day and Mother's Day we operate extended hours and delivery times are 7am-9pm. These orders are our very highest priority. If you have ordered too late to make the funeral service, we will call to let you know quickly so that you can make other arrangements or have something sent to the home of the family. We normally contact the funeral home to verify the time of the viewing and make arrangements for the flower delivery. If you have selected a delivery date that is before the actual viewing, we will deliver to the viewing per the funeral home instructions. If you have ordered for a funeral viewing on Sunday and it is too late to deliver on Saturday or Sunday, we will contact the funeral home to verify that there is a viewing or service on Monday and reschedule the order. Schools do not allow us to deliver direct to the student. We will leave the flowers at the front desk. Please note if the recipient is a student, teacher, or administration. Orders to high schools should be placed early because they are delivered by 2pm. Deliveries are available on Saturday from 10 to 5. We do not deliver on Sunday other than Mother's Day Sunday and other applicable holidays. We are unable to deliver flowers to a P.O. Box or an A.P.O. address. Depending on the delivery location, if the recipient is not available at the time of delivery, the delivery person may leave the gift in a safe place for the recipient to retrieve when they return, such as with a neighbor, on the back porch, or leave a message for the recipient to call to arrange for delivery. If the recipient's address is incorrect and delivery was attempted to the address, there is a $10 re-delivery fee. Rose & Blossom Delivery is not responsible for deliveries made to incorrect addresses submitted to us by the customer. If such a delivery is made, the customer assumes responsibility for the entire purchase. Same-day orders are processed immediately, and usually cannot be changed. Due to the urgent nature of florist delivered products we are unable to cancel or change orders already in process at the florist, en route or delivered. To cancel or change an order that has not been processed, please call our Spokane Valley location 509.921.7673. 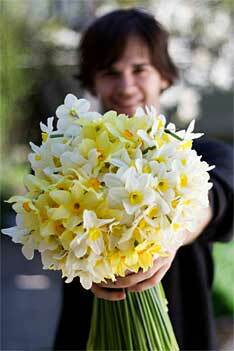 In some cases, the florist may contact the recipient to ensure s/he will be home to accept the delivery. This is usually done with rural deliveries. Arrangements can be left at the door with weather permitting. The arrangement will be left in an inconspicuous place and the recipient will be contacted. We have tried to determine the best way to deal with requests to send flowers anonymously (no signature on greeting card). Many florists refuse to send deliveries anonymously. But in an effort to satisfy our customer's wishes we have continued to allow this practice. Almost always the recipient calls us to find out who sent them. Due to issues with stalkers and overzealous suitors people take this anonymous gesture very seriously. In the spirit of expressing emotions with flowers, we do our best to make this a positive situation instead of something that could weigh on the recipient's mind or even torment them. So we will divulge the senders name to ease the recipient's mind. By ordering from us you agree to this policy.